Warner Home Video has released a new trade ad for the upcoming Batman: The Dark Knight Returns – Deluxe Edition home video release. The new special collection features both Batman: The Dark Knight Returns, Part One and Batman: The Dark Knight Returns, Part Two animated titles, which were originally released separately in late 2012/early 2013, together as one package on both Blu-ray and DVD. The two-disc special releases are set to hit shelves on October 8th, 2013, and will feature a mix of exclusive content and previously-released content. Click on the image below to view the entire trade ad. 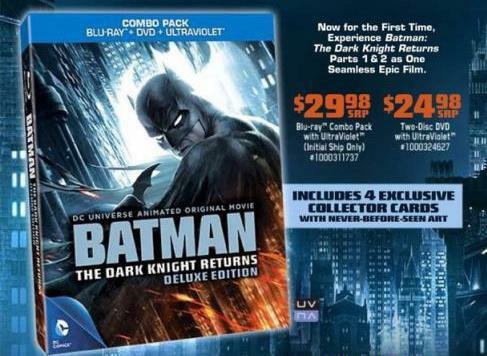 According to the ad, consumers will be able to view Batman: The Dark Knight Returns, Part One and Batman: The Dark Knight Returns, Part Two as “one seamless epic film.” The trade ad also states the new home video release will include a Frank Miller-centric documentary “Creating a Masterpiece: The Dark Knight Returns,” making-of featurettes, cast and crew commentaries, a preview of the next DC Universe Animated Original Movie title, bonus cartoons, digital comics, and collector cards. 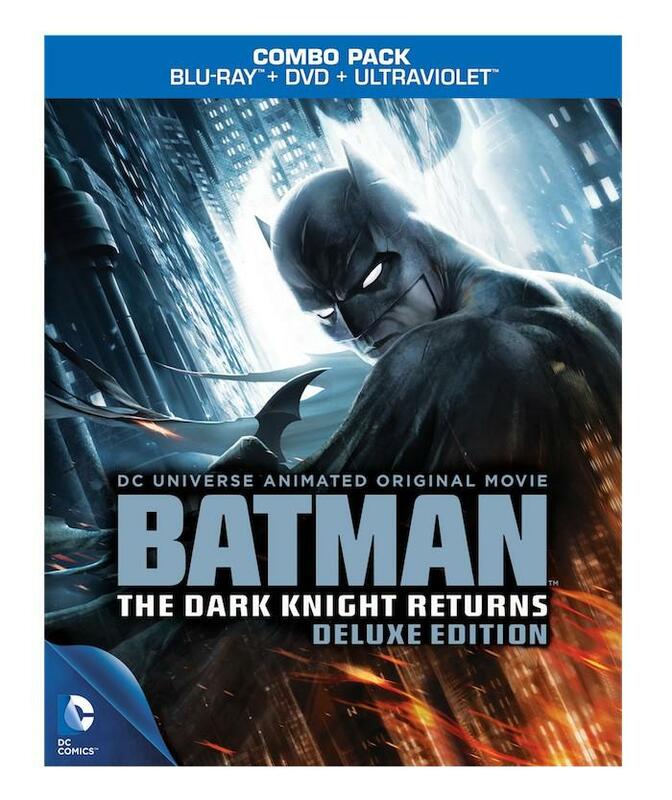 The runtime for Batman: The Dark Knight Returns – Deluxe Edition is 148 minutes, and is rated PG-13. Warner Home Video is set to release official announcement details, which will include a more detailed look at the new exclusive bonus content, shortly. Initial details can be found here. 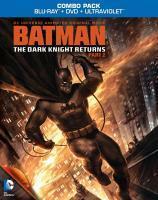 Both the Blu-ray and DVD release of Batman: The Dark Knight Returns – Deluxe Edition will be two-disc releases. The Batman: The Dark Knight Returns – Deluxe Edition two-disc set, featuring both Batman: The Dark Knight Returns, Part One and Batman: The Dark Knight Returns, Part Two animated titles together as one package, will hit Blu-ray and DVD on October 8th, 2013 from Warner Home Video. While currently unconfirmed, La-La Land Records is expected to release a special soundtrack release for Batman: The Dark Knight Returns to coincide with this release, but details are as of yet finalized. Stay tuned for additional updates here soon at The World’s Finest. “Man of Steel” Now Playing! 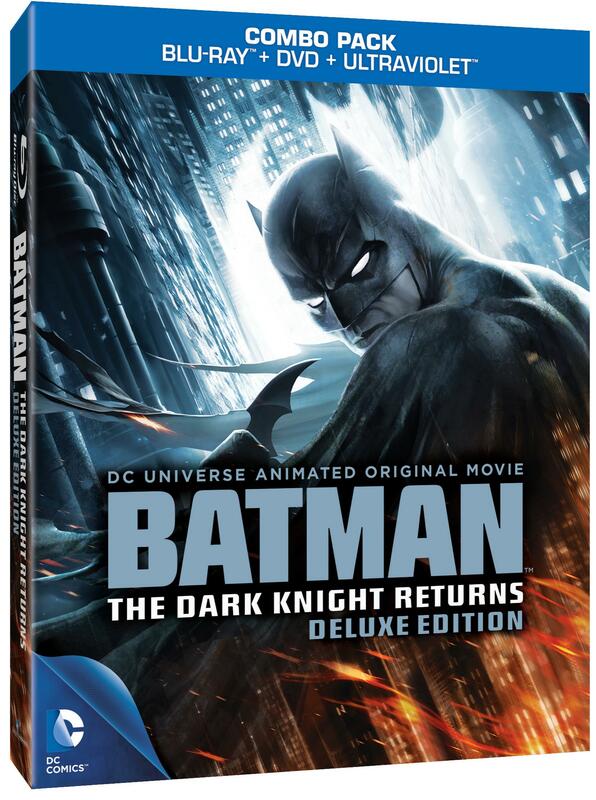 Warner Home Video has released package artwork and initial details for the freshly-revealed Batman: The Dark Knight Returns – Deluxe Edition home video title, a new special collection of the recent two-part animated adaptation of the classic The Dark Knight Returns comic series. Batman: The Dark Knight Returns – Deluxe Edition features both Batman: The Dark Knight Returns, Part One and Batman: The Dark Knight Returns, Part Two animated titles, which were originally released seperately in late 2012/early 2013, in one package on both Blu-ray and DVD. The two-disc special releases are set to hit shelves on October 8th, 2013, and will feature a mix of exclusive content and previously-released content. Initial details and package artwork can be found below. Warner Home Video is set to release official announcement details, which will include a more detailed look at the new exclusive bonus content, shortly. 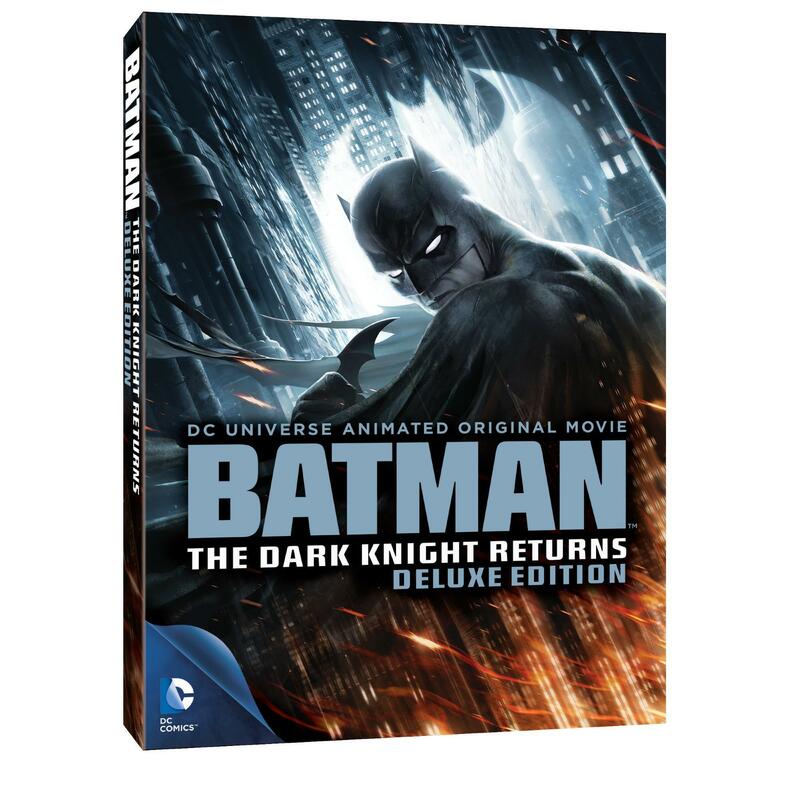 Both the Blu-ray and DVD release of Batman: The Dark Knight Returns – Deluxe Edition will be two-disc releases. The Batman: The Dark Knight Returns – Deluxe Edition two-disc set, featuring both Batman: The Dark Knight Returns, Part One and Batman: The Dark Knight Returns, Part Two animated titles in one package, will hit Blu-ray and DVD on October 8th, 2013 from Warner Home Video. While currently unconfirmed, La-La Land Records is expected to release a special soundtrack release for Batman: The Dark Knight Returns to coincice with this release, but details are as of yet finalized. Stay tuned for additional updates here soon at The World’s Finest. According to various home media retailing outlets and independent research, the recent Batman: The Dark Knight Returns, Part Two direct-to-video animated feature has moved an estimated 167,000 units in its first week – the weekend ending February 3rd, 2013, with 62,000 of those sales coming from DVD and 105,000 from the Blu-ray format. The latest film in the DC Universe Animated Original Movie line, currently available to own on Blu-ray Combo Pack, DVD, Download, and onDemand, is the second in a two-part adaptation of the acclaimed 1980s comic series The Dark Knight Returns starring a retired Batman who dons the cape and cowl to deal with a city decaying into crime. To compare, Batman: The Dark Knight Returns, Part One moved an estimated 157,500 units in its first week – the weekend ending September 30th, 2012, with 60,500 of those sales coming from DVD and 97,000 from the Blu-ray format. 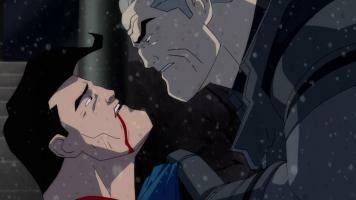 The previous DC Universe Animated Original Movie has been a consistent seller since its release, having sold over 300,000 units in combined Blu-ray and DVD sales. Blu-ray sales have accounted for an estimated 71% of total Batman: The Dark Knight Returns, Part One home video sales since its first week, with the high-definition format easily the dominant media. Keep in mind the sales numbers above do not take into account rental numbers, OnDemand numbers, or legal download numbers. Additionally, please note that the Batman: The Dark Knight Returns, Part One Two-Disc Special Edition DVD release did not go wide until March 16th, 2013. A source at Warner Home Video indicates that a possible Batman: The Dark Knight Returns special edition release, combining both parts of the animated feature together, will likely happen soon. Above is the cover art for all three separate home video releases for the direct-to-video Batman: The Dark Knight Returns, Part Two animated feature. Click on the links below to discuss both the new Batman: The Dark Knight Returns, Part Two animated feature and its respective Blu-ray and DVD home video releases. Click here to read the The World’s Finest reviews of the Batman: The Dark Knight Returns, Part Two animated feature and Blu-ray release. Continue to the The World’s Finest Batman: The Dark Knight Returns subsite, a single destination for both installments of the two-part animated feature, for more details and content. A co-production of Warner Premiere, Warner Bros. Home Entertainment Group, DC Entertainment and Warner Bros. Animation, the direct-to-video Batman: The Dark Knight Returns, Part Two animated feature is now available to own on Blu-ray Combo Pack and DVD, On Demand and for Download. A name familiar to long-time fans of the DC Animated Universe titles, such as Batman Beyond and The Zeta Project, writer Bob Goodman returns to Gotham City as writer once again, wrapping up the two-part Batman: The Dark Knight Returns animated adaptation. The Warehouse 13 writer sat down with The World’s Finest to discuss the animated feature Batman: The Dark Knight Returns, Part Two, currently available to own on home video and through digital outlets, along with other projects he’d like to tackle and upcoming works. Click on the image below to continue on to the all-new interview! Click on the links below to discuss both the new Batman: The Dark Knight Returns, Part Two animated feature and its respective Blu-ray and DVD home video releases. Click here to read the The World’s Finest reviews of the Batman: The Dark Knight Returns, Part Two animated feature and Blu-ray release. Stay tuned for additional content and coverage of this title coming soon. Continue to the The World’s Finest Batman: The Dark Knight Returns subsite, a single destination for both installments of the two-part animated feature, for more details and content. A co-production of Warner Premiere, Warner Bros. Home Entertainment Group, DC Entertainment and Warner Bros. Animation, the direct-to-video Batman: The Dark Knight Returns, Part One animated feature is now available to own on Blu-ray Combo Pack and DVD, On Demand and for Download.